This is a two tactic set up with different formations. The aim is to employ possession and attacking football with lower/higher tempo depending on the situation. The highest possession I have achieved is 75%, the average after a full season is 60%. Awesome average passing success rate of 86%. 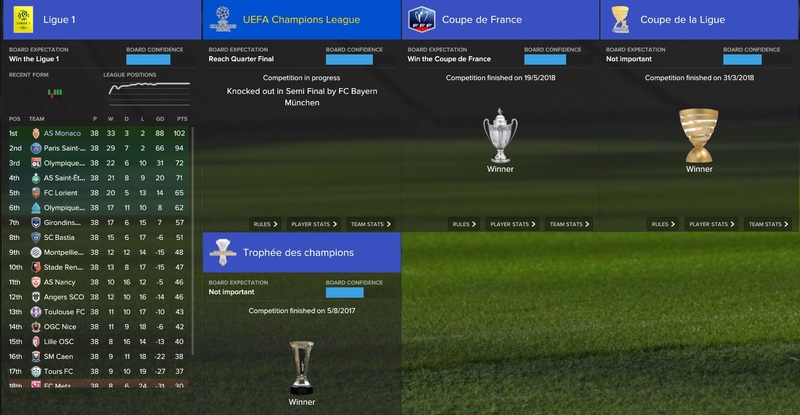 With the tactics I have won all possible titles during 8 seasons, including a quintuple (5 titles) in my third season, an incredible septuple (7 titles) in my seventh season and a sixtuple in my eighth season. The Premier League was won 8 times consecutive, the Champions League 4 times (3 consecutive), breaking almost every competition and club record in the process! The two tactics have slightly different team and player instructions and different mentalities. The 433 AM or also seen as 4231 is a more attacking formation, it is best employed when the opposition uses more players in defensive positions and less than 3 players in attack (including AMR/AML/AMC/ST). The 433 DM is the classic version aimed more on controlling the ball anywhere on the pitch. It is generally a more defensive formation. Appropriate time to use it would be when the opposition uses more than 3 players in attack (including AMR/AML/AMC/ST). If the opposition is using exactly 3 players in attack it is important to decide which one to use depending on the quality of the opposition. If you are not sure go for the 433 DM because it is more balanced and I recommend it for most matches. *This is just a guideline and doesn't mean that the tactics won't work against specific formations, use them however you think is best. *Both tactics are created for attacking possession football, if u need a waste time defensive tactic better find another one and put it in the third slot. The tactics have set pieces routines for every aspect and though I am no expert in them I believe they are good enough. Goalkeeper - defend: Any good goalie will do. Suitable wonderkids: Donnarumma, Ederson, Rajkovic. RB - Wing Back support: This player will run wide to provide support for the Inside Forward and also provide crosses. Suitable wonderkids: Henrichs, Bellerin, Lirola. LB - Full Back support: A less attacking full back, who will cut inside and cross less often in order to combine with the Winger. Suitable wonderkids: Grimaldo, Gaya, Shaw. CBs - CD defend: Typical offside trap setup. Suitable wonderkids: Rugani, Laporte, Zouma, Varane, Marquinhos. DM - DLP defend: Holding midfielder providing defensive support. Suitable wonderkids: Maia, Bazoer, Neves. MCR - BBM support: You need a player who can defend and attack. Suitable wonderkids: Renato, Dele, Cook. MCL - AP attack: A very technical role,acting as an advanced playmaker he will provide the link between midfield and attack. Suitable wonderkids: Bernardo Silva, Ante Coric, Odegaard. AMR - IF attack: Cuts inside and provides creative passes, dribbles and also shoots when in good position. Suitable wonderkids: Lemar, Ousmane, Ounas. AML - Winger attack: A wider attacking option to provide more unpredictability, he will dribble more to the wide and provide crosses, he will also shoot when in good position. If you have a right footed player, teach him PPM (trait) to "cut inside from the left wing". Suitable wonderkids: Mbappe, Pulisic, Martial. ST - False 9 support: He will link the two wide players and also provide the finishing touch. Any good striker can work. Suitable wonderkids: Origi, Kuki, Eggestein, Dybala. MCR - DLP defend: Holding midfielder moved to CM position. AMC - AP support: This is the player acting as a playmaker and providing the support between midfield and attack. ST - Advanced Forward attack: More advanced striker, because of the player behind him. *The listed wonderkids are only a few to provide some ideas for your team, there are many more good options on the market. The team training I use is balanced with average intensity, choose match tactics as preparation during the preseason and when the tactics are fluid switch to defending positioning for away games and attacking movement for home games. For individual training just train your players for the appropriate positions. I like to train my attacking players to use one-two passes, which helps a lot in creating chances in some matches. Train your MCL (AMC in 4231) , AML, AMR, and ST. Team talks are important to keep morale high, try to encourage your players and be less harsh in away matches. If the morale is low, a good way to lift it up is to arrange a team meeting. Please provide feedback on how the tactics work for your team! Optional: Donate any amount so I can continue to work hard and create quality tactics for you in the future. 66 comments have been posted so far. When do I use 4-3-3 and when do I use 4-2-3-1?? Have tweaked the 4-1-2-2-1 (4-3-3) to great success - changed RB to FB attack, LW to IF attack, copying instructions from LB & RW to both, and striker changed to Complete Forward support duty. Also removed the 'shoot less' instruction from all players where possible. 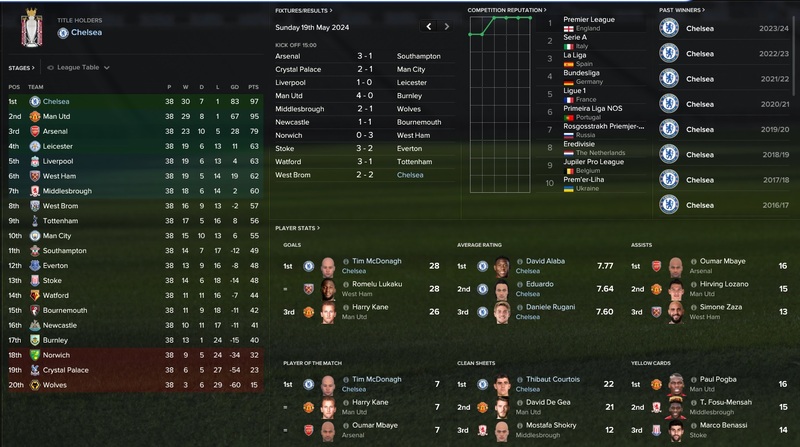 Am now conceding less, scoring more, and have highest possession, passes completed, tackles, goals and headers won (?!) in the EPL! 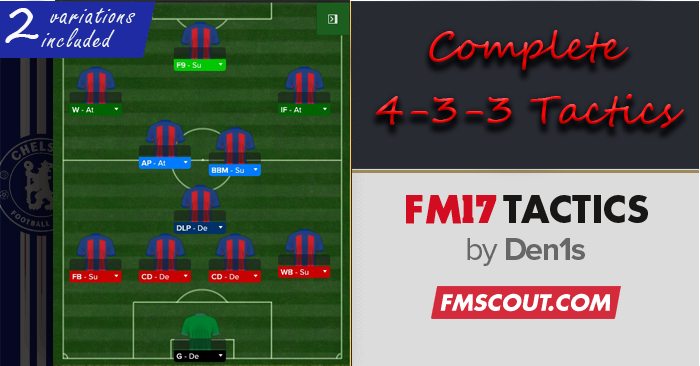 Don't really use the 4-2-3-1, but set up the 4-3-3 as a second counter attacking formation by dropping deeper and setting to counter (obviously! ), works really well away from home against bigger sides. Hello, the tactic is great, but i have some questions about it. First, can i use an advanced forward? if yes, should i use attacking roles on the winger and the IF? And second, what program should i use to open the tactics, once unziped? Hi, downloads as a .rar file which doesn't load into my game. Hi, can you please send me the sreenshots of your tactic. I would really appreciate it, and it would help me a lot. Thanks. Hi! Can you please send me or post screenshots of your tactic? Player Instructions, Team Instructions and Set Pieces. I'm excited by reading this tactical analysis and I would like to use it in my FM 2016 game. 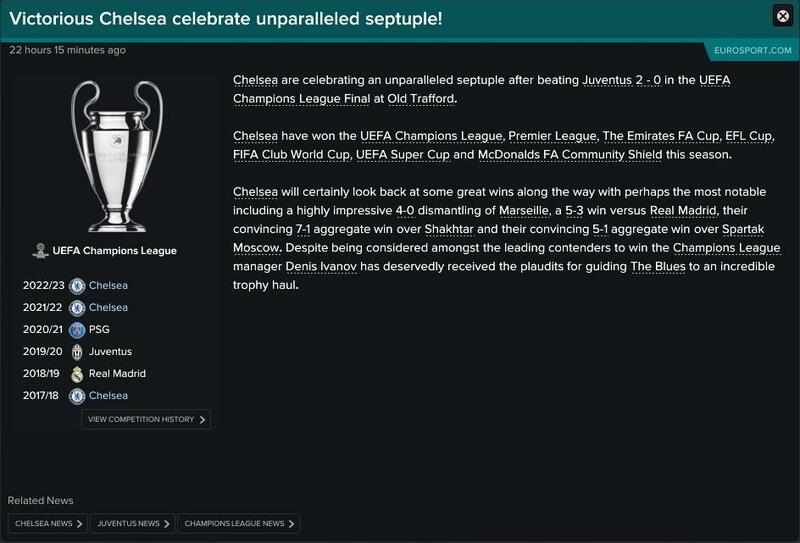 I don't have FM 2017 so I can replicate it. If you could help I'd appreciate it. Is there a vice-versa version of these tactics. I mean Winger on AMR and Inside Forward on AML ? Switched back to flexible team shape and changed some roles and instructions. Anything to note with this update? It will be more defensive, because the DLP has "hold position" and the player will tend to stay back. That's was all I was wondering really. Played 3 so far, 2 wins and 1 draw. Pretty good with slightly low familiarity on a couple of subjects. If only I could get Griezmann to play well!! Yeah I am keeping an eye on the comments, but i dont have enough time at the moment to play the game and i think the current version works well, though no tactic is 100% perfect, so if you think something must be changed, just do it. This looks exactly like the kind of system I need a bit of help with on my Arsenal save,season 5 has gone right down the pan and I think I need a bit of a rethink and retool. Are you still keeping an eye on this thread mate? I've got the pair of formations (41221 and 4231 v2) all set up and ready to go. Hope it helps me out of this pickle I am in! Try and use whichever works best for your team, thats why i have put links to old versions, its confusing because i always look to improve something, but i cant test everything with different situations, players and teams, so its better just to see what you like or dont like, after all we all play for fun.